Remember the times when you rocked away on your Commodore 64? Well, the gaming industry has changed quite a lot since then. It is one of the leading entertainment branches in the world, and it evolves quite rapidly. This is why nowadays we have multimedia gaming chairs, designed to provide the most intense gaming experience, and the only limit is your budget. Fortunately enough, you don’t have to spend thousands of dollars on a good gaming chair. This is why we present you with the 51396 gaming chair made by X Rocker. 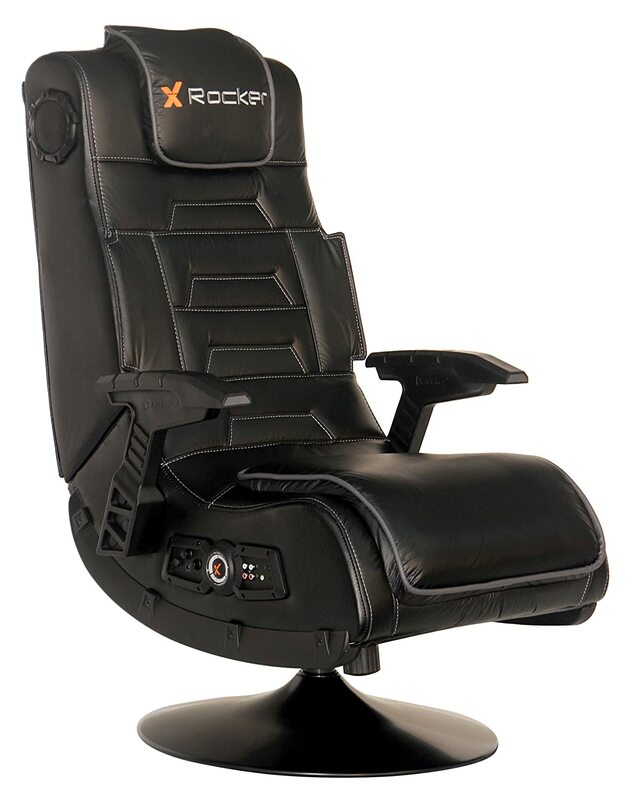 If you’re an avid gamer you probably know about X Rocker, but if you’re not, let’s just say they are quite reputable where gaming chairs are concerned. The 51396 is one of the most popular multimedia gaming chairs as it provides massive amounts of comfort combined with state-of-the-art multimedia features. All of this comes at a fairly competitive price, so people often buy them for other purposes as well, such as watching TV, reading a book, or simply sitting down to relax. This chair is mostly aimed at passionate gamers, as it provides the ultimate sitting experience, especially if you take into account all the multimedia features. It can be connected to your gaming console and it has built-in speakers, among other things. If you put these gaming goodies aside, it is also a very comfortable chair which could be enjoyed by non-gamers as well. As is usually the case with most gaming chairs, you will not be delivered a pre-assembled product. On the other hand, this shouldn’t be something to worry about, as it is very easy to assemble. In fact, the majority of the chair is already assembled, but you still need to attach the base and the armrests, and that only involves fiddling with a few screws. The 51396 gaming chair comes with all the required cables and includes an A/C adaptor, as well. The first thing you notice is the somewhat weird pedestal upon which the chair sits, but it is wide enough and it gives you enough balance. The only issue is that the chair is a bit harder to move around, as it has no wheels. The chair itself is big and comfy, and you can really sit in it for hours without experiencing any fatigue. It has armrests designed to resemble in-game weaponry, but honestly they are not as good as the rest of the chair, and for the most part you don’t even need them. The 51396 can be tilted if you don’t like sitting in an upright position, but this adjustment has its limits, so don’t expect miracles. The main USP is of course the good sound system. It is actually a 2.1 surround system with two speakers right near your head and a woofer at the back side of the chair. It’s loud, crisp, and crystal clear. These speakers can be used to enjoy music, but in all honesty, they are made to hear clearly when someone or something is sneaking up on you in one of your favorite games. There are controls for volume, treble, and bass, which are more than enough to tweak the quality of the sound you’re getting. Through a wireless unit, the chair can be connected to your TV or another audio source, and you can also connect it with different consoles including Xbox One, Xbox 360, PS4 and PS3, and Nintendo Wii and Wii U. The cherry on top lies in the fact that you can connect it with other chairs for a really mind-blowing gaming experience. Depending on the gaming console you use, and the type of gaming you intend to indulge in, it takes a few minutes to set it up properly. When connected to your console, the chair will also blare all the sounds through the speakers, but we strongly advise you to keep the volume levels down. The speakers are really loud, and they could damage your hearing. We know that the multimedia features are really cool, if anything else so that you could show off in front of your fellow gamer buddies. But if you want to invest your money in a good gaming chair without any bells and whistles, we recommend checking out the SL-4000 from Vertagear. It will provide you with the very pinnacle of comfort and adjustability, but it will still look way cool as its design is inspired by racing car seats. With gaming chairs, different people have different preferences, especially with regard to their budgets. The X Rocker 51396 gaming chair certainly will not break the bank and it will give you quite a lot for your hard-earned cash. It is very comfortable and its multimedia and connectivity options make it really stand out from the crowd, especially in this price range.